Elizabeth Fiedler is excited to announce endorsements from Neighborhood Networks, an independent progressive political organization that emerged from the city’s grassroots in 2004 and has grown to include activists throughout the City and into the suburbs, and 215 People’s Alliance, an independent community based organization fighting for racial and economic justice. “Neighborhood Networks was wowed by Elizabeth Fiedler with her deep understanding of a broad range of issues, with her concerted campaign to touch the lives of all of her constituents, with her energy and devotion to economic and social justice and with her background as a rural Pennsylvanian with the potential to cross the tough divides in Harrisburg to make real change.” said Gloria Gilman, Chair of Neighborhood Networks. 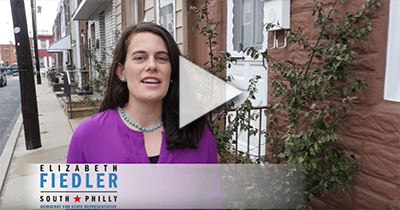 “We believe Elizabeth Fiedler will stand up for working people and fight back against the right wing offensive both in Washington and Harrisburg,” 215 People’s Alliance leader and long time labor and community activist, Antoine Little said. Elizabeth is running for State Representative in the 184th because she is committed to prioritizing the needs of working people over the profits of corporations and the super rich. Elizabeth’s campaign is building a broad coalition of support across organized labor, dedicated and long time community members, progressives and community organizations. The support from 215 People’s Alliance and Neighborhood Networks joins an impressive list of endorsements from the Philadelphia Federation of Teachers, American Federation of Teachers, AFSCME, DC33, DC47, 1199C, Pennsylvania Association of Staff Nurses and Allied Professionals, Pennsylvania Working Families Party, UNITE HERE!, Teamsters Brotherhood of Maintenance of Way Employees, National Organization for Women, Representative Brian Sims, Philly Set Go, Equality Pennsylvania, Reclaim Philadelphia, Emily’s List, Our Revolution, Liberty City Democratic Club, DSA, Food & Water Action and Grassroots Advocacy for South Philadelphia. Elizabeth Fiedler’s campaign will be holding a fundraiser on Tuesday, April 24, 2018, 5:30p-7:30p at 1651 E. Passyunk Avenue.